It's becoming increasingly easier to make your PC setup more eco-friendly, thanks to a wide range of both software and hardware solutions available to help you go green. , such as creating more environmentally sound products and ensuring that those products' manufacturing processes, overall design, everyday use and eventual disposal have as small an environmental impact as possible. It's no secret that not every manufacturer is as eco-centric as they could be, but with the help of certain product makers and a handful of selected software, you can do your part. One example of poor eco-design comes courtesy of the new USB Eco Button. Saving some money on your energy bills is one thing, but saving the entire planet is a much more admirable goal. Unfortunately the recently released USB Eco Button, which promises to save both the planet and your wallet, fails on both counts, adding to the ever-growing list of useless gadgets. The device, which is essentially a USB-powered plastic button, puts any Windows based machine, except those running Windows 7, into a low-power energy saving mode. Once activated, the included software will then monitor your computers power usage, in addition to recording how much CO2 the Eco Button has saved. The problem? The Eco Button is largely unnecessary, since such low-power modes can be implemented via software-only fixes. Considering the materials and energy used to manufacture it, the Eco Button could be doing more harm than good. The final icing on this not-so-green cake? The $14 'Eco Button' seems to be a second-rate imitation of another previously released--and trademarked--'Ecobutton'. That said, there are numerous other ways to green up your OC. Edison from Verdiem - Free energy monitoring software that can help reduce your PC's power usage. PowerManager 3 from DSSW - A Mac-only power management app, which aims to save you hundreds of kilowatts-per-hour (kWh) per year. A free 30-day trial is available. WatchOverEnergy from AKS-Labs - Although now a fairly old piece of freeware, this Energy Star approved Windows only program could help you save up-to $75 per year in energy thanks to its power management tools. PowerSave - Available for both PC and Mac, PowerSave promises intelligent power management. Free trial available. BizEE Benchmark from BizEE Software - Although aimed primarily at business users, this software can be tweaked for home use, creating your very own home energy audit. JSutils - JSutils has a range of energy saving software worth checking out. In addition to the various software solutions, the major OSes all have built-in power-saving modes, such as OS X's Energy Saver and Windows' Power Options control panel and sleep mode, which my colleague Jason Cross discusses in greater detail here. Western Digital - WD offers a whole range of green hard drives, which promise to save, on average, 4 or 5 watts over other similar drives. MSI - Last year MSI introduced the Wind board, a motherboard aimed designed to save power. When idle, it uses 10% less power than comparble products. Antec - Antec provide a variety of power supply units (PSU) that boldly claim to be amongst the most power efficient PSU's on earth. 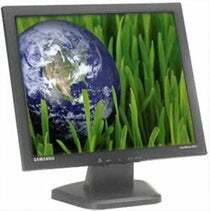 NEC - A recent offering from NEC is the new eco-conscious MultiSync 17-inch monitor. It has a special eco-mode designed to save over 42% in power versus similar speced monitos. It also has an Energy Star approval. By using some of the products mentioned above , along with various other alternatives, you can save yourself some money over time, while doing your bit for Planet Earth. Have you gone green, or do you make use of some green products when it comes to computing? Be sure to let us know in the comments and share your eco-experience.